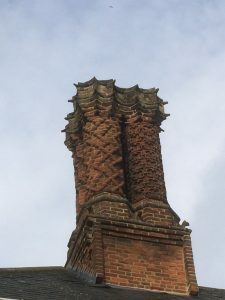 The ethos of Walden Sweeps is to provide a clean, safe, professional chimney sweeping service that offers great value for money to our customers; whilst simultaneously striving to raise customer’s awareness of safety and environmental issues pertaining to the use of their solid fuel appliances/ chimneys. Walden Sweeps is owned and run by Paddy McKeown. I am a retired Metropolitan Police officer who has retrained as a chimney sweep. 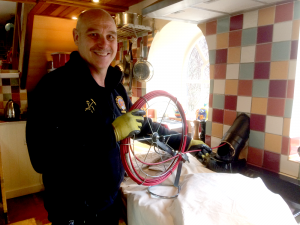 I have successfully completed the extensive Guild of Master Chimney Sweeps training programme −the Guild of Master Chimney Sweeps is a national trade body which is committed to promoting the highest professional standards within the chimney sweeping industry. Additionally, I have undertaken and successfully completed the Power Sweeping course at Rod Tech UK. Walden Sweeps is covered by NFU Public Liability Insurance to the sum of two and a half million pounds. I have a wealth of practical knowledge and experience of sweeping. In addition, I have been involved in the installation of wood-burning stoves with a local, reputable stove installation company. I can offer a range of sweeping equipment which includes click-lock rods and brushes for power sweeping, various sized Vipers (German-designed rods for different diameter lined flues), along with the more traditional manual sweeping screw-lock rods and brushes and a ‘Dust Control’ industrial vacuum cleaner. Consequently, I can sweep cleanly and efficiently all open fireplaces, as well as wood-burning stoves, Agas, Rayburns Alphas, Parkrays, Baxis, inglenooks and biomass boilers. I also have CCTV equipment for examining and recording the interior condition of flues/chimneys.